I’m now entering my eighth year at Headwater and so far on my list of educational trips I have ticked off France, Spain and Switzerland. You may say, like me, that these are the more popular and well known destinations so when I learned I was going to be heading to Croatia I thought this was certainly going to be a very different experience. As I drove away from the small airport of Pula I really didn’t know what to expect; how different would it be to where I have been before? At first I passed olive groves and vineyards and then as I drove on I was met by lush, deep green, breath-taking countryside and in the distance, the fairy tale town of Motovun! It soon became apparent that now I was definitely somewhere different! I was in Croatia! The sun was shining as I wound my way to the top of the beautiful town of Motovun. I thought to myself, am I really going to get to stay in this truly stunning place? The answer was ‘yes’! It certainly proved to be a unique place to be, cobbled streets with stunning views that stretched for miles and the icing on the cake, the Hotel Kastel, formerly a family palace in the 16th Century. Today it’s the perfect place to stay and includes a very inviting wellness spa. Idyllic! On the first evening, after sampling some of the local gastronomic delights and taking a stroll around the town, I met with the lovely Romina, Headwater’s local representative who briefed me on the coming week’s itinerary. Having grown up and lived in Istria all of her life, Romina has a real passion for the area. Her knowledge is excellent and she is even part of the local mountain rescue team! Whilst I knew I wouldn’t be doing anything quite so challenging, I was certainly lucky to be in such safe hands. And so to the walking! The next day the sun was out again. Armed with a delicious picnic, provided by the hotel, I decided to get going and start the adventure with the longest walk on the itinerary Motovun to Grosnjan, a challenging 15 miles! 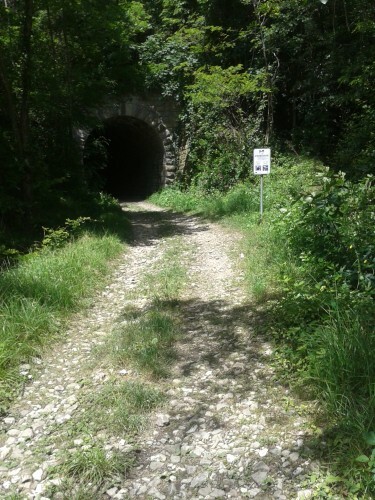 This walk mainly followed a section of the old Parenzana railway, a line that formerly ran from Trieste in Italy, through Slovenia and finishing in Porec, Croatia. The walk was very peaceful taking me through tiny and remote hamlets, much like the paths of the Italian Strada Bianca. All in all, despite it being the longest walk of the week, I felt completely relaxed. The walk provided pure tranquillity and the feeling that you really were getting away from it all! At the end of the walk, I arrived at the beautiful town of Grosnjan, a true gem. This is an enchanting town frequented by artists who come to paint the stunning views and quaint cobbled streets that the town has to offer. 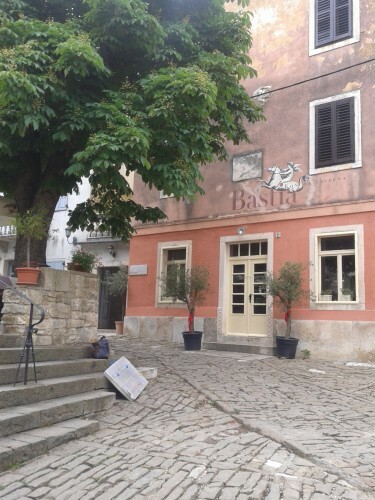 After a chance to look around I was picked up by Romina and taken back to the Hotel Kastel. I didn’t waste any time in getting myself straight to the hotel’s wellness centre and making the most of the pool to indulge my tired feet, a real treat after a long days’ walk! I was quietly pleased with myself knowing that I had achieved the “hardest part” of the trip and that if that was the benchmark, anything else would be a breeze! The walk from Motovun to Buzet was certainly once again a chance to take in the rich and deep green countryside of the area. One of my favourite parts of the trip was about half way through this walk when I left the woods and came to a natural open balcony on a hillside where I sat to have my picnic, literally on the edge of a huge rock where I could see for miles! After lunch, I continued the descent through the villages and vineyards winding my way up to Buzet and reaching our destination, the Hotel Vela Vrata! This for me was my favourite of the three hotels, beautifully and tastefully decorated with antique furniture but with all the modern necessities and luxury touches to make your stay very comfortable. Not only that, the food here was excellent. The evening meal was a set menu, providing a perfectly thought-out and sumptuous menu of small courses using the very best ingredients that the region had to offer. The most perfect way to end the day. The third walk I chose was the Buzet to Opatija walk, a six mile walk that took me to the top of Mount Vojak. This was very different to the previous day’s walks as it was all uphill, through beech and pine forest. This is a popular walk for both locals and tourists and it’s of no surprise as once at the top, you are rewarded with the most amazing and spectacular view over Istria. If you’re lucky, on a good day you can see as far as Switzerland! After taking in the view I headed back down, aided by the large shepherd like sticks that the forest had provided us with, stopping at one of the various benches en route for lunch. And so the final day of the trip arrived. I reached the coast; I was on the ‘Castles to Coast Walk’ after all! My last stay was at the elegant Sveti Jakov Hotel in Opatija, certainly a stylish and comfortable way to end a holiday of walking! To round the itinerary off, I took a relaxing stroll to the town of Lovran along the promenade that took me past some stunning Croatian villas flanked by palm trees. Just beyond were the clear and inviting waters of the Adriatic Sea. Beautiful! Overall, I would say that if a Headwater holiday was a recipe, then Croatia would provide you with all the finest ingredients for a truly delicious dish; excellent locally produced wine, stunning scenery, exquisite food, including the chance to sample truffles (without having to remortgage your house), peaceful and relaxing walks and of course, luxury hotels to provide you with the most comfortable stay! If these are the all the things you enjoy on a holiday then I invite you to sample this culinary delight from the Headwater menu! Get in touch now 01606 822497 to book your trip.